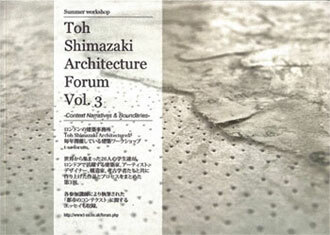 The Toh Shimazaki Architecture Forum Book Vol. 3 is now available. The book features students’ work alongside lectures and workshops by David Phillips, Ana Araujo, Guy Hunt, Willem De Bruijn, Adrian Friend, Anna Mansfield and Takero Shimazaki. It also includes the work from the students who participated including me. You can see the work texture + patterns + plants here. The book is available direct from the practice priced at £15 + p&p.